Despite the gray day and the window it is a beautiful photo. Mesmo assim é uma bela fotografia. Autumn has really arrived. Nice view Bill. The only thing missing is a hawk perched in those bare branches. That tree is magnificent. Great photo. It can be as gray as can be and the green of Ireland still reigns . . .
Hello, pretty view even with the overcast sky. Happy Friday, enjoy your weekend! Where are the sheep? There should be sheep in a landscape like that! Great photo and the view is so beautiful! Lovely vivid green color! Have a great weekend! A nice clear shot taken from a moving bus! This is one of my favorite kinds of photos. The barrenness is, in itself, dramatic and beautiful. Mooi gedaan Bill van achter het venster. The starkness of winter! Nice one, Bill! Such a beautiful morning it is! 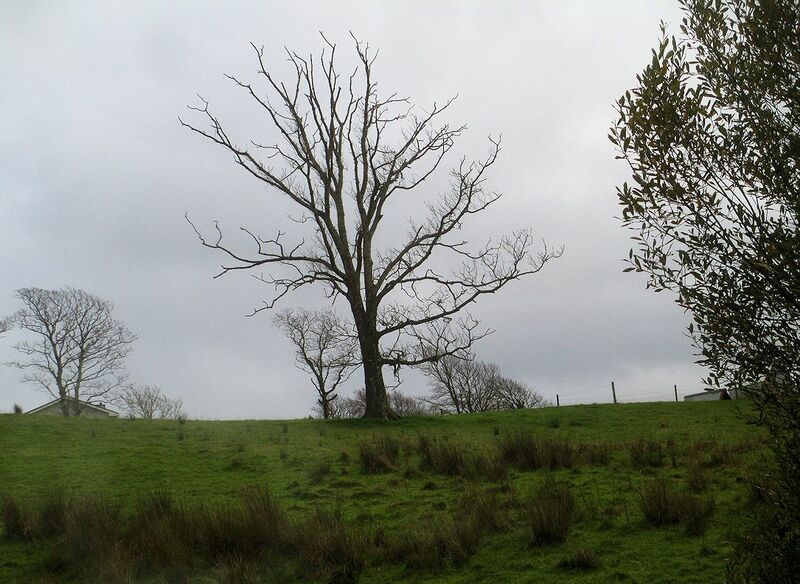 The stark, leafless tree makes the photo interesting. Nice one! One of those days here, too, today. Great looking spooky Halloween tree (even though we're a week past it). That tree is the perfect compliment to that sky. The cloudy sky certainly does enhance those tree silhouettes. Good shot for a moving-in-a-bus situation. I like the look of that tree. We lived in Ireland in the mid-80s, down in Cork area. So green that it made my eyes ache. Tree has a lot of personality. Beautiful capture ad pretty leafless tree! That's a great shot from the window.